Due to the fact that we have high numbers of students graduating at our Saturday sessions, we have made some adjustments to the arrangements to enable the process to flow as smoothly as possible for both graduates and guests. It is very important that you arrive an hour before the start of the ceremony i.e. 08:30 for the morning session and 13:30 for the afternoon session. There will not be a student procession into the hall for these two ceremonies, graduates will be directly seated in their allocated seats on the floor of the Indoor Sport Centre. 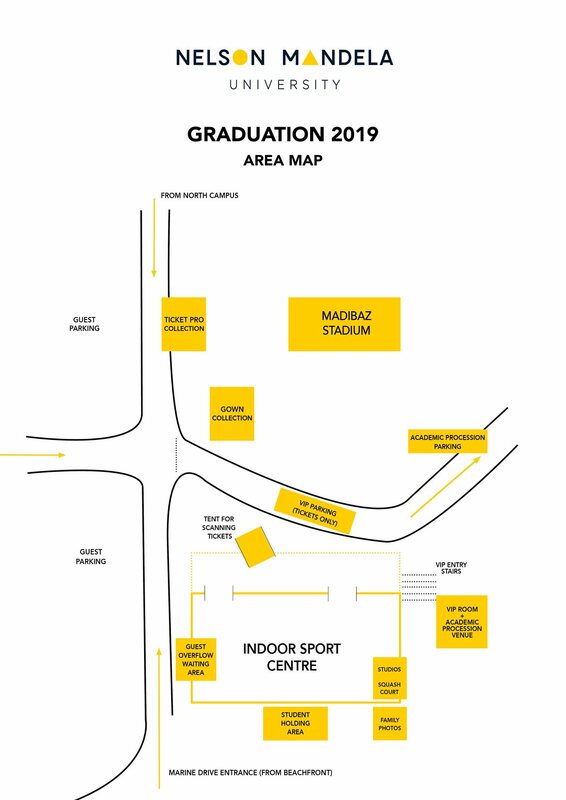 Graduating students should please use the entrance next to the student holding area (as on the map below) to enter the hall, ensuring ease of traffic flow at the guest entrances. The four guests of each graduate will enter the hall with their guest tickets and will be seated accordingly. Should there be extra guests, they will be directed to the overflow venue which is a large marquee tent adjacent to the main hall. Here, the extra guests will be able to watch the live-stream of the ceremony on a big screen. We trust that you will enjoy your special day.